Known as shakkarpara or shakkarpare in the North of India, this sweet holiday treat is referred to as shankarpali in the Western part of the country. It is not just the names that differ slightly, however; the cooking techniques vary somewhat as well. But no matter how they are prepared, well-made shakkarpara is crisp and crunchy, but not hard and not overly sweet. 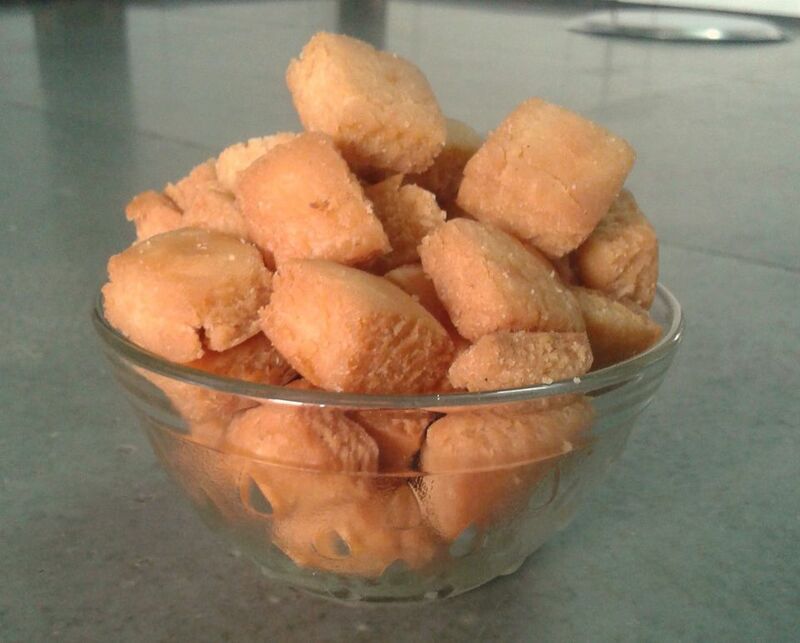 Shakkapara is served during the festivals of Ganesh Chaturthi, Diwali, and Christmas, but are an ideal snack when you want something a little sweet to crunch on. You can make shakkarpara well ahead of time (2 to 3 weeks prior) and store it in a cool, dry place in an airtight container. If you don't have ghee or don't have the time to make some, it can be substituted with 1/4 cup butter or 1/4 cup cooking oil such as vegetable, sunflower, or canola. Put the ghee and milk in a small pan set over low heat. Cook until the ghee is melted. Remove the pan from the heat and stir the ghee-milk mixture well. Pour the ghee-milk mixture into a deep mixing bowl or a shallow, wide mixing platter. While the ghee-milk mixture is still hot, add the sugar and stir until all the sugar dissolves completely. (The heat will help dissolve the sugar faster.) Once the sugar has dissolved, set the mixture aside to cool completely. In a bowl, combine the flour, semolina, and salt. Once the ghee mixture has cooled, add the flour mixture, a little at a time, stirring after each addition. Use clean hands to knead the mixture into a smooth, medium-firm dough. The dough should not be sticky. Wrap the dough with plastic wrap and set it aside to rest for 30 minutes. Unwrap the dough and knead it again until it is soft and pliable. Divide the dough into 6 equal-sized balls. Roll each ball between your palms until it is smooth and free of cracks. Lightly flour a clean work surface and use a rolling pin to roll the dough ball into a round circle about 1/3-inch thick. Do not worry if the circle has cracked edges. Use a knife or rotary pizza cutter to cut the circle into strips that are 1-inch wide. Cut again to turn these strips into diamond shapes. Remove the edge pieces that are very small or have cracked edges. Do not discard, as they can be reused later to make more shakkarpara. Repeat with the rest of the dough balls. As you keep cutting out the diamond shapes, keep them on a plate lined with paper towel. While you are cutting out your shapes, heat the cooking oil in a deep wok, pan, or deep fryer. When all your shapes are ready and the oil is hot, add small batches of the cut dough into the hot oil and fry until golden on both sides, stirring often using a slotted spoon. When done, remove from the oil with the slotted spoon and drain on paper towels. Do this until all the pieces are fried. Allow the fried shakkarpara to cool completely and then store in an airtight container in a cool, dry place.